Anne & Cindy are a mother and daughter duo from Boise, Idaho. Learn more about their cute pattern “Twas the Night Before Christmas” released in the Quiltmania magazine n°122 (november-december 2017). Anne & Cindy are a mother and daughter duo from Boise, Idaho. Like a lot of us, we started our sewing journey years ago making clothing, but once we experienced the world of quilting, we were hooked and never looked back. We love to combine applique and embroidery to create whimsical designs with a hint of tradition that touch and squeeze the heart. Lots of our designs incorporate dyed wool which we hand dye ourselves. Christmas is a favorite time of the year for a lot of us and one day while mulling over an idea for a ‘Twas the Night Before Christmas’ quilt, Anne said “what if the Christmas mice are laying around in the Christmas balls?”. We ran with that idea. 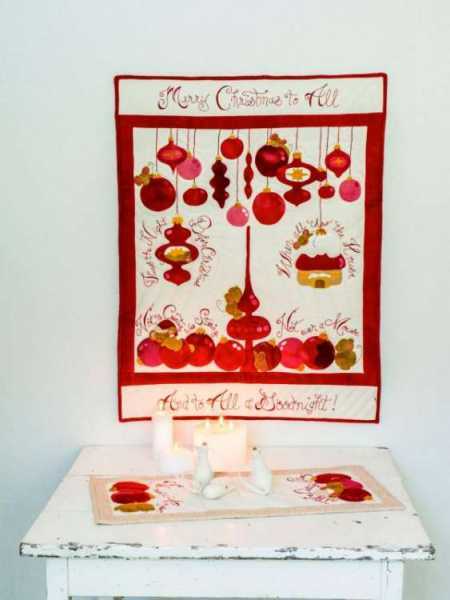 We used premium cream sparkle wool and beautifully hand-dyed colored wools to created OUR version of “Twas the Night Before Christmas- wall hanging”. For those of you less ambitious, the table runner is a nice choice. We hope you enjoy and HAVE FUN!!! Learn more about the Quiltmania magazine here.